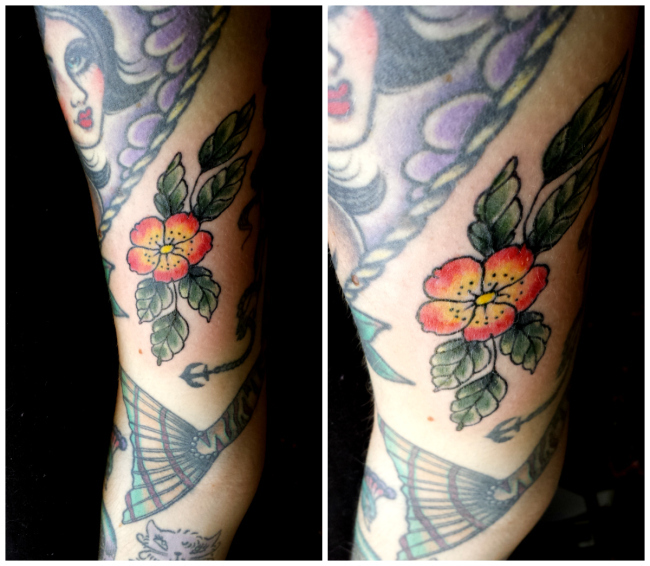 Last week I managed to sneak in a quick little appointment with my favourite apprentice tattooist Harriet Hapgood. I have been tattooed by Harriet 4 times now, as well as accompanying an ex-bf to get a few tattoos from her too, so it feels like visiting a mate now. I just wanted to fill a small gap, and didn't really care what Harriet picked. We ended up just sketching out the shape, and drawing a cute little flower and leaves. Perfect. I love the colour choice too (I also let Harriet pick the colours).